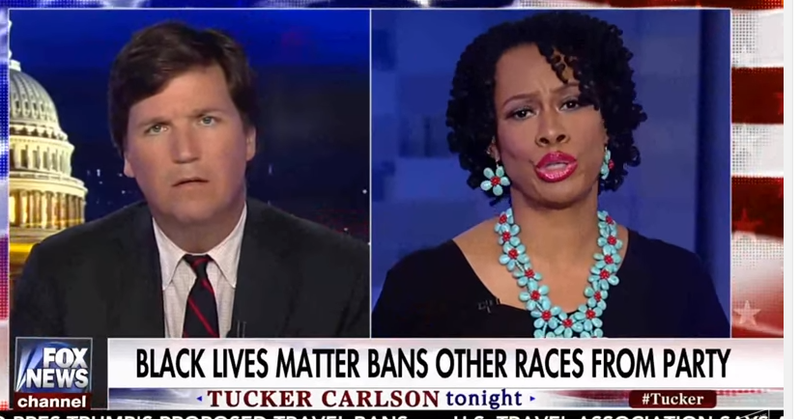 Essex County College professor Lisa Durden was indefinitely suspended two days after a fiery and belligerent appearance on Fox News’ Tucker Carlson Tonight. On Tucker Carlson’s June 6 program, Durden launched a fierce defense of a black-only Black Lives Matter Memorial Day party restricting whites from attending based solely on their skin color. Carlson challenged her position, asking why it’s okay to exclude people based on their race. “I thought the whole point of Black Lives Matter, or one of the points, would be to speak out against singling people out on the basis of their race and punishing them for that because you can’t control what your race is, and yet they seem to be doing that. Explain that to me,” Carlson said. “What I say to that is boo hoo hoo you white people are angry because you couldn’t use your white privilege card to get invited to the Black Lives Matters, all black, Memorial Day celebration,” Durden answered derisively, cutting off Carlson. After a few seconds of killing her mike, he asked his question again. Upon arriving to class for the summer session on June 8, Durden was instructed to cancel her classes and report to the human resources department where she received a letter from the vice president of academic affairs informing her she was suspended until further notice. Although the letter did not mention her appearance on Fox News, it was brought up immediately afterward in a meeting with the HR department. Durden was told someone complained that she associated herself with the college on the show. “It seems to me they’re going to make up some reason. We’ve got to figure out what that is and why. Is she too outspoken?” Farber commented. Durden wants her job back and argues her right to free speech has been assaulted. Her colleagues agree and have started an online petition demanding she be reinstated. “I find it shocking that an African-American woman would be so disrespected at her place of employment for merely exercising her First Amendment right to free speech,” Professor Jennifer Wager stated in Durden’s defense. Read more at the Daily Caller and additional coverage at NJ.com. The professor is wrong about only having one day to focus on her race. There’s an entire month dedicated to Black History Month, not to mention that she is welcome to focus on her race every single day and seems to be already doing so. The rest of us are more interested in expanding the details in our collective history instead of segregating them. I don’t care about Prof. Dursen per se. I do care if she is preaching racism in her classes as well as promoting a “racial hate” mentality in her students. I wouldn’t fire her for her appearance on the Tucker Carlson Show. It was a “wake-up” call for many viewers of all political persuasions who didn’t realize that this type of academic racism/professor existed on college campuses. Then let her go back to teaching with the caveat that “racial hatred” is not on her curriculum. Without it, she” be gone before Kwanzaa comes. So glad that “Love Trumps Hate”–wouldn’t you agree?